New to our wholesale range today are these beautiful Glazed Brioche Braids, our Brioche is made using a traditional French recipe with lots of eggs, butter, and milk. It is soft, and fluffy and has a rich buttery flavor. it is covered in a fondant glaze, toasted almond flakes, and dusting sugar. Perfect as a morning tea item on your café menu, but equally likely to impress sold as a whole loaf in your deli, or bakery. 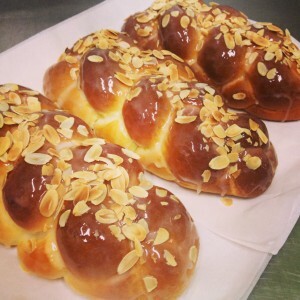 We also do Brioche loaves, rolls, and slider buns to meet all your brioche requirements.